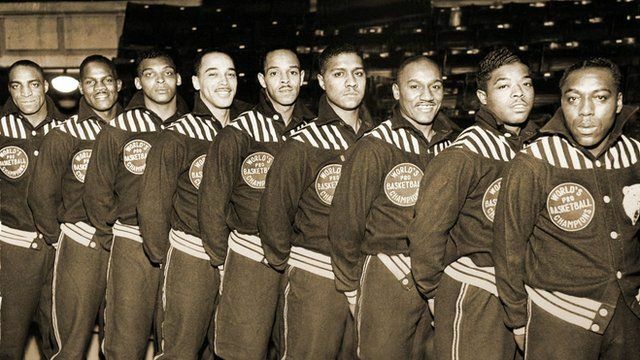 How 'Black Fives' changed basketball Jump to media player Even before the NBA became racially integrated in 1950, African American teams known as 'black fives' were taking to the court against white opponents. The heroic all-black regiment of WW1 Jump to media player When the "Harlem Hellfighters" returned home from fighting in World War One, they were hailed as heroes by some but also faced violence and racism, according to a new graphic novel about the legendary all-black military unit. Eaten by cannibals in New Guinea? Jump to media player Was the son of a former New York governor eaten by cannibals? The author of a new book on the disappearance of Michael Rockefeller in 1961 claims to have solved one of America's most enduring mysteries. This week the National Basketball Association has been dealing with a scandal after the owner of the Los Angeles Clippers team, Donald Sterling, was given a lifetime ban for making racist remarks. His comments come nearly 65 years after the NBA became racially integrated. But even before that, African-American teams were taking to the court against white opponents. Known as the "black fives" for the number of starting players, these teams came to define an era. Now their story is the subject of an exhibit at the New-York Historical Society.